We're having a sale! 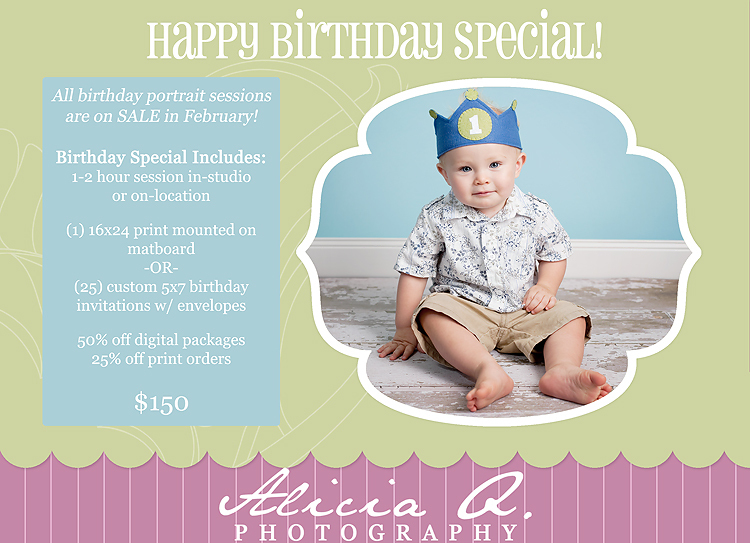 For the month of February only, book a birthday portrait session at a super discount! I love how excited kids get about their birthdays and now parents can add to the celebration with photos to mark the occassion. These sessions must take place in February and can be done at my in-home studio in Menifee, your home (within 30 miles of 92584), or an outdoor location of choice. You can bring as many outfits as you'd like, but do keep in mind these sessions will last between 1 and 2 hours total. Your session will include either a 16x24 print mounted on thick matboard, or a set of 25 custom birthday announcements. Additionally, you can take 50% off digital packages and 25% off prints 16x24 and smaller. Call me or email me to schedule your session today. As always, space is limited and weekends fill up quickly!